A leading building and plumbing products distributor wanted to hold an engaging, informative and inspiring conference that also impressed its employees with the latest technology. Employees needed to have the freedom to express their opinions, feel confident enough to raise questions and feel that their opinions had been listened to. The session also needed to encourage them to interact and have fun in the process. How did we go about achieving this? As soon as delegates arrived at the conference they were given a Smart Badge personalised with their name, job title and full colour company and conference logo. Delegates simply swiped their badge over our Smart Kiosk stands to register their attendance without the hassle of having to queue and their name be manually ticked off a list. The tablets also allowed them to view an interactive table plan which showed their table and allowed individuals to be seated quickly. 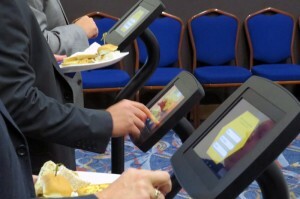 Delegates could also remind themselves of their table at any point simply by touching in at a Smart Kiosk. In the main conference room delegates were provided with a Messenger Handset so that they could participate in a series of voting questions which were designed to see how engaged employees felt they were within the company. Delegates had the freedom to express their opinions simply by voting on the handsets as to whether they strongly agreed, agreed or disagreed to a number of key statements. Voting results were then displayed along with a percentage break down which were used to provoke discussion. Results were stored so that they could be used by organisers for post-analysis. Each table was also provided with one Smart tablet so that individuals could freely send in any messages, questions and comments about the event throughout the day. A conference facilitator was also given a Smart tablet so that they could see questions and comments as they flowed into the system. Relevant themes were grouped together and key messages could be instantly forwarded to the CEO chairing the event. Hosts were able to receive honest feedback from delegates and could choose which questions to deal with live and follow up on any other issues at a later date. The CEO was impressed with just how easy the Smart tablet was to use and how quickly messages were received. To inject some competition and entertainment into the day, during lunch we set up self-standing Smart Kiosks so that delegates could participate in a Blockbusters style quiz with questions set on the company. The objective of the game was to find the most knowledgeable employee. Individuals got into the competitive spirit and shrieks could be heard when questions were answered incorrectly. Each correct answer lit a red hexagon on the Smart tablet screen. Individuals had to complete a line across the board of hexagons in the fastest time possible for a stake in the ‘gold run’ and a prize trip to Europe. The CEO also got into the competitive spirit by donning a dazzling gold jacket to host the ‘gold run’ finale and award the winner. 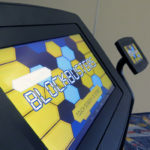 Using the Smart Kiosks to play the game meant that delegates could take part at their own leisure, the technology was easy to use and there were no complicated instructions. Further, results were available instantly to give to host organisers. All the elements helped provide a palpable ‘buzz’ to the event and ensured all delegates not only enjoyed the conference but were also engaged by the content.